DIY TV Antenna Installation, Cabling and More! Almost all LCD or Plasma TVs can be used a computer monitor. Why would you want to do this? One good reason is for displaying slideshows of photos, presentations or websites. You can also use it for full screen video conferencing via Skype with family, friends or colleagues. In this article I’ll explain how to do it. The method you choose will be governed by what connectors your computer and TV have. If both have VGA or DVI, I would strongly recommend using those. If the computer has DVI and the TV has VGA, or vice versa, you can get an inexpensive adaptor to go from one type to the other. When using DVI or VGA you will need a separate audio connection. Many TVs have a 3.5mm audio jack beside their DVI or VGA in which is used for this. 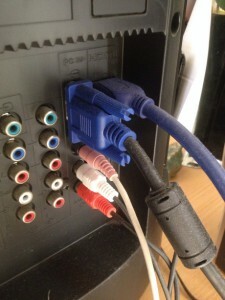 Others will have a 2 RCA in which will usually require an adaptor to be connected to the audio out on your computer. If they both have HDMI this is probably the easiest way for you as HDMI also carries audio. Be aware that HDMI isn’t designed for regular plugging and unplugging though. Once your PC or laptop has been connected to your TV there is often an additional step of enabling the external display. It may be automatic or you may have to do something. On a laptop this is usually a function key at the top of the keyboard, one of the keys with an F number. IT will look like a diagram of a screen or two screens. Hold down the function key and press that button. If nothing happens, press it again a few times, watching each time to see what happens. They usually cycle through a few modes. On a PC running Windows you may have to go to Control Panel->Display to set up the additional monitor. You can potentially have the computer screen and the TV screen running at the same time showing different displays. In this sort of situation you just move the mouse from one screen to another by moving it to the side of the screen. Running your presentation or video conference on your TV will make it much easier to share with others! Next Post:Moving From a Rental? Moving Into a Rental?